Wirtschaft zum Kuckuck Old traditional tavern from the 1920s with scenery of a Saturday evening. Carter brings supplies with new barrels of beer, waitress Birgit-donates. The farmers in the area meet for a drink. The village youth enjoys dancing The dance figures on the upper balcony as well as the dance floor on the lower right and the mill wheel turn with the music. 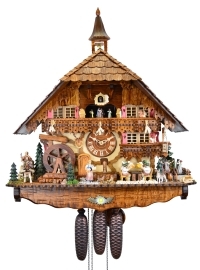 At hourly blows, the farmers close and the bell on the roof moves with them. 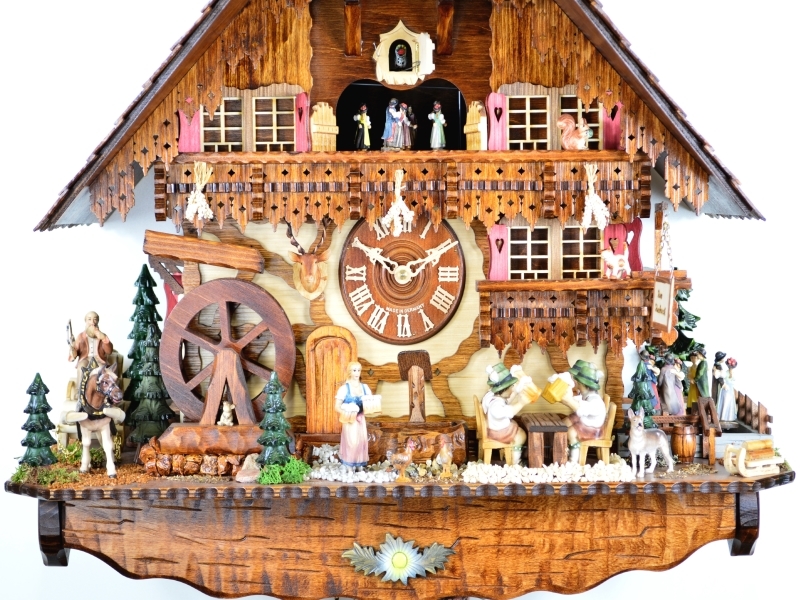 All figures and decorative elements are made of wood, handpainted. An eye-catcher from every perspective! The watch is completely shaken by hand. Wooden figures, wooden dial, wooden hands, wooden cuckoo, wooden pendulum. Our premium models with a long warranty period are equipped with various extras; in mechanics we use some very durable parts. Extras: wooden knob on the Nachabschaltung, genuine hinge on the cuckoo door (optical and mechanical improvement), antique-look chains.